A new viral video featuring a man who just got his wisdom teeth pulled, rambling on about Deadpool 2 (amongst other things), has prompted Ryan Reynolds to invite him to the movie's premiere in May. When it comes to social media, Mark Hamill and Ryan Reynolds both come up as masters of their craft, often letting their personalities shine through more than others while having fun with their fans. Reynolds has taken his one step further by blurring the line between himself and Wade Wilson though as it's hard to think of anybody but Wilson, aka Deadpool using the phrase "wisdom-testicles." James D. Eversole recently had his wisdom teeth removed and his wife decided to film him right after he had the procedure done while he was still semi-unconscious. Eversole can barely talk in the video, but he is clearly worried that he missed Deadpool 2, which he repeats a few times. The video went viral and caught the attention of Ryan Reynolds who took to Twitter to invite him and a guest to the world premiere of Deadpool 2. Reynolds (or Wade Wilson) had this to say. "Years ago, I had my wisdom-testicles removed. I know how painful it can be. 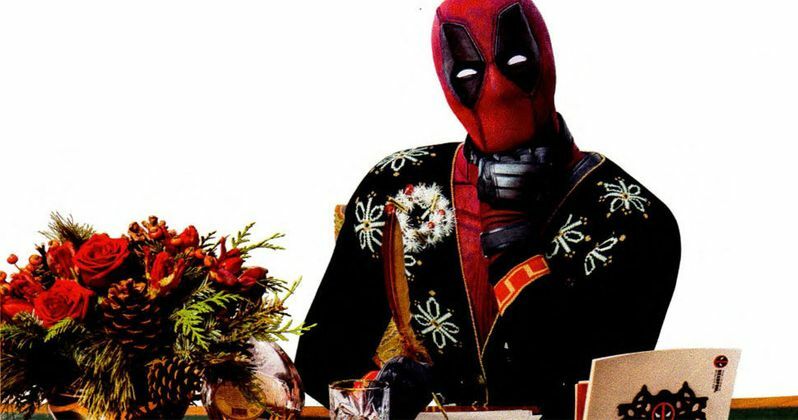 Consider this your official invite to the Untitled Deadpool Sequel, James. I'll see you and a guest in May." Ryan Reynolds recently took to social media to help solve a dispute for a few followers who were wondering who the hottest "Chris" was. Is it Pratt, Evans, or Hemsworth? As it turns out, Reynolds wasn't able to choose just one and replied that, "When ordering ice cream, I like to get all three scoops." The Deadpool star decided to stir the pot even further, adding that he actually likes to add "some Pine nuts generously sprinkled on top," which is a reference to another famous Chris: Chris Pine. From settling the hottest "Chris" to inviting viral video stars to the world premiere of Deadpool 2, Ryan Reynolds proves that he is pretty versatile in his talents. In other Deadpool 2 news, the latest humorous promotional poster reimagines Michelangelo's The Creation of Adam from the Sistine Chapel ceiling with the Merc with the Mouth as Adam, ceremoniously posed on a beanbag chair as he reaches towards the godlike Cable, played by Josh Brolin. While God was surrounded by a flock of angels in the original artwork, Cable is surrounded by a glowing blue light. The psychic mutant mercenary with a bionic arm is known as a time traveler in the comics, and he comes here to touch tips with his trustee guns and cuddly teddy bear. The poster was released at the time that it was announced that Disney was buying parts of 20th Century Fox, leading many to worry about the R-rating for Deadpool 2. However, the merger will not have anything to do with the rating for the upcoming sequel, so fans need not worry. Though the Disney acquisition of Fox won't affect Deadpool 2, it could affect the future of the character in upcoming movies, which could even see him team up with some friends in the Marvel Cinematic Universe. For now, we'll just have to wait for some more Deadpool 2 news and a real trailer. While we wait, you can check out the James D. Eversole's hilarious wisdom tooth video along with his invitation to the Deadpool 2 world premiere below, courtesy of Ryan Reynolds' Twitter account. And of course, some Pine nuts generously sprinkled on top.